Conservation requires a great deal of ‘thinking forward’–thinking forward towards the next project, thinking forward towards policy developments, thinking forward for population numbers, and thinking forward for the future of elephants. This month, we are pleased to highlight some of the many ways IEF thinks forward including fostering the healthy birth and care of baby elephants, spreading conservation messaging, and of course planning projects for next year! We’d also like to thank our supporters at Woburn Safari Park in the United Kingdom for this month’s Newsletter Headline Photo! 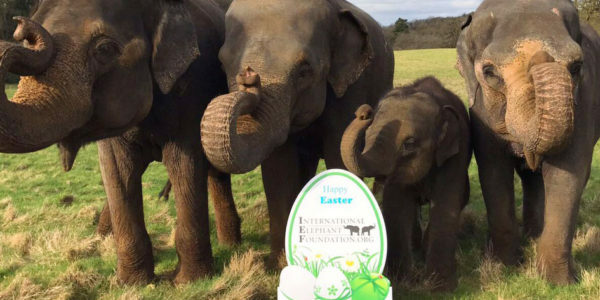 Their annual Elephant Conservation Weekend over Easter is a fantastic event, bringing together wildlife enthusiasts, keepers, animal ambassadors, and the public to foster conservation education and get everyone ‘thinking forward’.